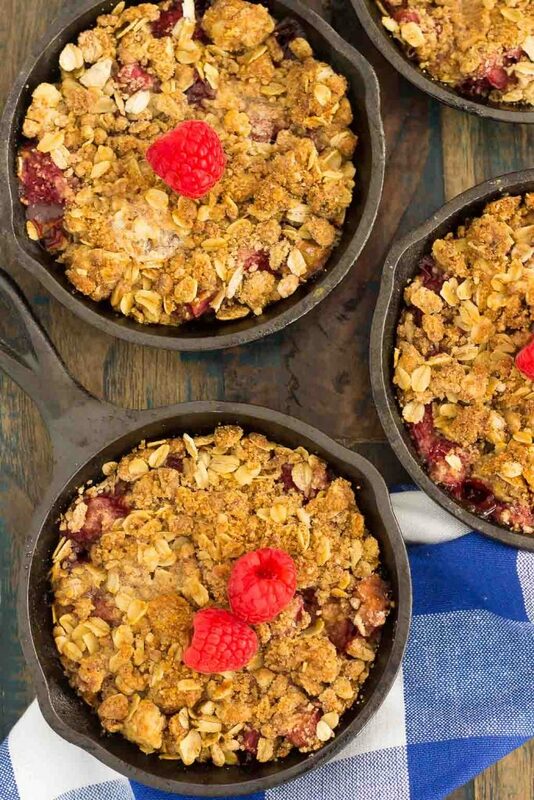 This Raspberry Rhubarb Crisp is filled with sweet raspberries, fresh rhubarb, and sprinkled with a brown sugar oat crumble. It’s prepared in just minutes and makes an easy dessert that’s perfect to enjoy all year long! Have I ever told you about my squirrel stories? I realize this is a pretty random way to introduce my latest (and greatest) recipe, but for some reason, I was thinking about this recently. You see, I feel like squirrels have a vendetta against me, and let me explain why. When I was about seven or eight years old, I was playing in the front yard at my mom’s house. I saw a squirrel, so naturally, being the child that I was, thought I could chase and catch it. I know, I know…super silly. Even my eight year old self knew this wouldn’t happen, but I thought I would try. So, I chased the squirrel and it ran up a small bush in the front of the house. It was the kind of bush where it almost looks like a mini tree, so I was able to peek underneath. As I did that, the squirrel ran off my forehead and far, far away from me. Now, I wasn’t scared that the squirrel literally ran off my forehead, but just more stunned. I ran into the house to tell my mom, and she didn’t believe me, until she saw the dirt marks on my forehead! Fast forward a few years later, and I was in Wisconsin Dells with my family on vacation. We were walking in a neighborhood, when I saw a black squirrel a few houses down from where we were. This was the first time I had seen a black squirrel, so I was pretty intrigued. I called the squirrel over by making my best tsk-tsk sound (like the squirrel would really listen, right? ), and to my surprise, it ran to me, up my shoulder, and sat that for a few seconds. I was stunned! The kids that were out in the yard stated that they fed him all the time, so he was a friendly squirrel. Well, friendly or not, I didn’t want a squirrel sitting on my shoulder. And now, even to this day, whenever I see a squirrel while I’m walking, I swear they’re staring me down. Which is why I feel that all squirrels have a vendetta against me. Ok, so maybe I’m being just a teensy bit over-dramatic. I’m not scared of squirrels, I just don’t like them. If you’re still following along after my oh-so wonderful squirrel story, then I promise you’ll love this tasty recipe! 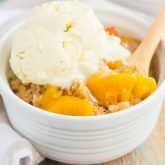 After all, I couldn’t let the summer go by without creating one of my favorite desserts, fruit crisp! That crumbly topping gets me every single time. This was actually my first time baking with rhubarb. Can you believe it? I love rhubarb pie and other desserts, but I’ve never ventured out on my own with making it. Well, that all changed, friends. I am happy to report that I’m officially hooked on baking with rhubarb. I love how the tartness pairs so well with the sweet raspberries. And since rhubarb is at its peak in the summer, I couldn’t resist stocking up on it. Now, let’s talk about that crispy, crumbly topping. Man, oh man, is it good! I’ll admit that it’s my favorite part of any type of crisp. This mixture is the perfect complement when sprinkled on top of the fresh fruit. It’s sweet, crispy, and contains just the right amount of flavor. 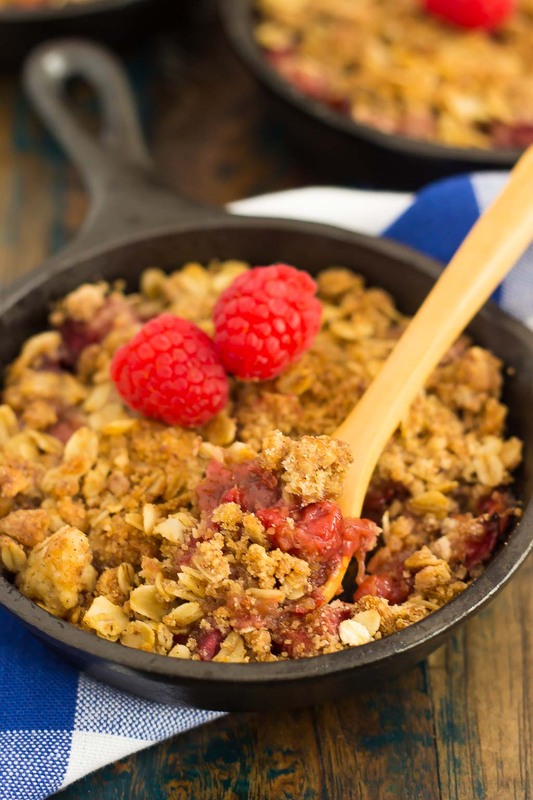 I chose to make this Raspberry Rhubarb Crisp in four mini skillets, just because I love mini desserts. But if you don’t have mini skillets handy, a medium skillet or baking dish will work just fine. And the prep time couldn’t get any easier. The hardest part is chopping the rhubarb and melting the butter, which isn’t really hard at all, right? 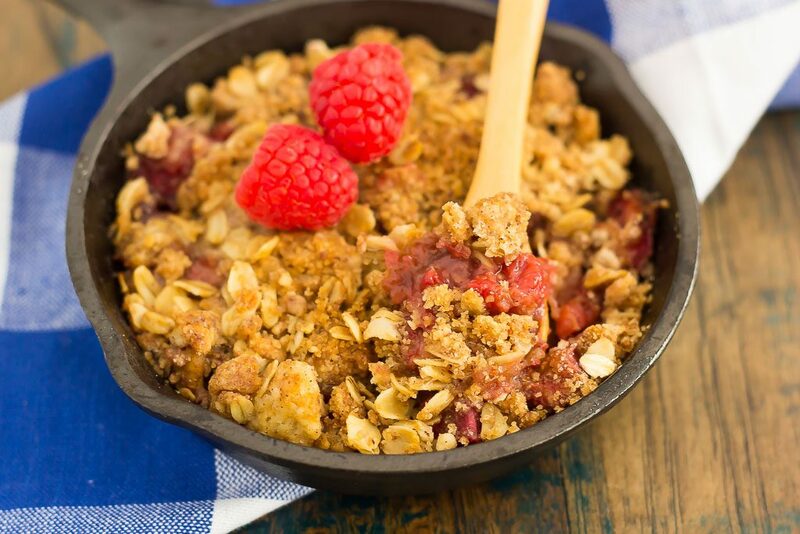 Once you dig into this Raspberry Rhubarb Crisp, you’ll be hooked on the sweet fruit, combined with that oh-so delicious crumble. It’s perfect to dig into when it’s right out of the oven, and can even serve as a sweet breakfast. And don’t forget the ice cream…plop a big ‘ole scoop of vanilla ice cream on top, and this will be your favorite crisp! Looking for more easy desserts? I’ve got you covered! 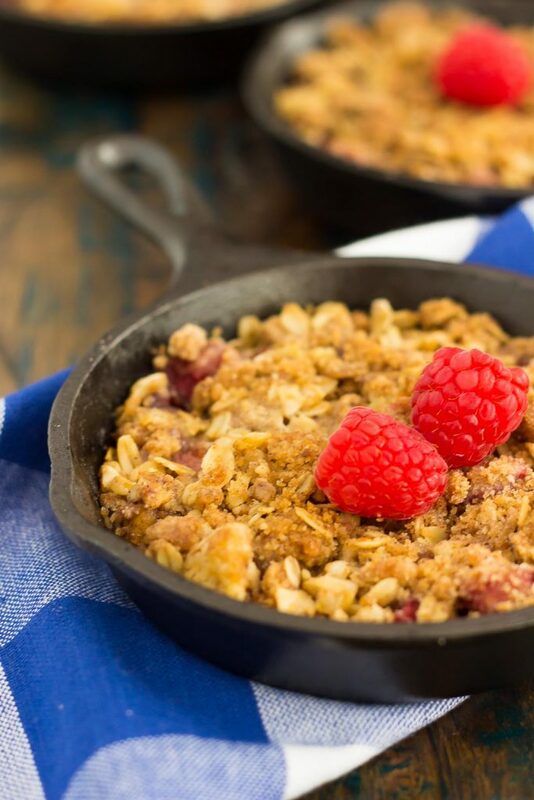 This Raspberry Rhubarb Crisp is filled with sweet raspberries, fresh rhubarb, and sprinkled with a brown sugar oat crumble. It's prepared in just minutes and makes an easy dessert that's perfect to enjoy all year long! Preheat oven to 375F. If using a baking dish, lightly grease an 8x8 pan with non-stick cooking spray. Otherwise, you can use 4 mini skillets or 1 medium skillet. Set aside. In a large bowl, combine the sugar, cinnamon, nutmeg, cloves, and flour. Add the raspberries and rhubarb. Gently toss to combine. Spoon mixture evenly between 4 mini skillets or 1 medium skillet or baking dish. Set aside. In a small bowl, combine the oats, flour, brown sugar, white sugar, cinnamon, nutmeg, and melted butter. Stir until it resembles a coarse mixture. Sprinkle topping evenly over the fruit. Bake for 35-38 minutes, or until topping is crisp and slightly golden. Serve immediately with vanilla ice cream, if desired. Haha very true, Kate! Maybe they want to be my friends! :) Thanks for the crisp love! Poor you! All that squirrel trauma! I had a piano teacher who fed them on the windowsill of her studio and they could come in sometimes. So hilarious, but I was worried they'd run across me all the time! This crisp is amazing. It's one of my goals to bake with rhubarb! Haha yikes! I would definitely not feed squirrels...they remind me of that squirrel from the movie Christmas Vacation! :) Thanks for the kind words, Mir! I greatly dislike squirrels. . in college, the squirrels there were crazy. not afraid of people and would come right up to you to get food. . yuck!!!! I love your story though! 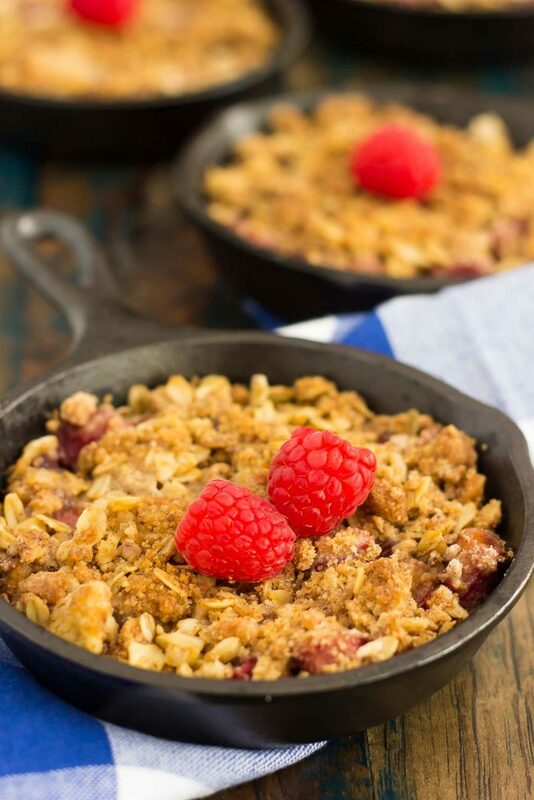 oh my gawd, this raspberry rhubarb crisp looks amazing!!! I haven't tried this combination before but I bet it's incredible!!! Thank you, Alice! Squirrels can be so weird! At my cousin's college...I saw an albino squirrel, quite the sight! Aww thanks, Megan! I guess it really does depend on how you look at squirrels! :) And thank you for the kind words! That's so funny, Gayle! Who would have thought squirrel would come that close?! Maybe you're the squirrel whisperer or something, lol :D The closest I ever got was when I saw one in my back yard eating the seed from the bird feeder. Suffice to say, no more bird feeder; the little guy was making a mess everywhere! 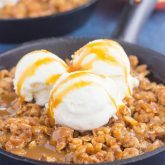 Love little desserts, especially in skillets and this one looks awesome! I've never tried the combo of raspberries and rhubarb and that topping sounds divine! I have rhubarb growing in my garden and I know the perfect use for it ;) Pinned, of course! Have a fantastic week! Haha yes! Maybe I am the squirrel whisperer! :) And yes, squirrels make the biggest mess with bird feeders. I think you would love raspberries and rhubarb together, it's such a delicious combo! Thanks for the kind words and pin, friend! I have a soft spot for all creatures and wish a squirrel would come close enough to hand feed. I've never been that lucky. This crisp sounds wonderful! I love that you combined rhubarb with raspberries. It's a nice change from the classic strawberry combo! Thank you, Jen! I agree, raspberries and rhubarb are a nice combination! What a story Gayle! I loved reading it! Squirrels could be a little dangerous and weird at times! This crisp looks delicious! 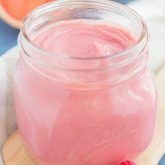 Never made anything with rhubarb, but pinning to try it! Squirrels can definitely be weird! :) Thank you, Mira! I'm not a fan of squirrels either, and they've never sat on my shoulder or used my forehead as a launching pad! I don't blame you for thinking they have something against you at all...they get too close for comfort! lol I love rhubarb, and it's so delicious combined with raspberries! I love these mini skillet crisps -- it's so fun to get your very own serving. These look delicious, Gayle! Haha yes, squirrels do get a little too close for comfort! :) Thank you for the crisp love, Marcie! Yes! Sinister and clever is a great way to describe squirrels! Thanks for the kind words and pin, Demeter! Hahah! I'm sorry they have a vendetta against you - but the surely do make for an entertaining story! I'm imagining that black squirrel gettin' all comfy on your shoulder! Hysterical (for the reader, not for you, I'm sure!!) I love mini skillet crisps! Just last night my hubby was saying he'd love a rhubarb pie...now I can do him one better! Yes! It's not the most exciting story, but definitely something different! :) Thank you for the kind words, Annie! I can't believe that a squirrel sat on your shoulder! That's crazy. This crisp looks delicious! Isn't it?! Crazy squirrels! :) Thanks, Kelly! Your squirrel stories are funny, Gayle! I'd have to say you are like a squirrel whisperer or something! I've never seen a squirrel come close to a human before! At least it;s only squirrels that have a vendetta against you... because I'm pretty sure birds have one against me. I kid you not, I've been pooped on by a bird more times than I can count! So at least the squirrels just mess with you and stare you down.. much better than being pooped on! ;) Anyways, I can hardly believe this is your first time baking with rhubarb because these crisps look fabulous!! Fresh rhubarb and raspberries are the bomb, so combining them in a crisp is genius! 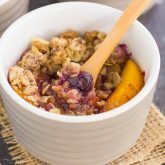 And that brown sugar oat crumble topping sounds amazing!! Plus anything mini makes me swoon! Pinning of course! Cheers, friend! Aww yes! I guess squirrel stares are better than being pooped on! :) Although I have been pooped on by birds a few times...yuck! Thank you for the crisp love and pin, friend! Eeek!! You need to borrow Emma from me! haha She lovessss chasing squirrels! She can come stare them right back down the other way for you! :) This crisp sounds fantastic!! I feel like I've been neglecting raspberries this summer! Haha I just might need to borrow your dog! Luckily, we don't have a lot of squirrels in my yard, just a lot of rabbits! :) Thanks for the kind words! Those squirrel shenanigans are hilarious, Gayle! I wouldn't want one sitting on my shoulder either - they're such creepy little rodents! I remember when I was in college the university president's wife was strolling along campus and a bunch of squirrels jumped or fell out of a tree and landed all over her. She freaked out and said they needed to do something about the squirrel problem! :) This crisp sure would take your mind of some squirrel problems! What a creative idea to use raspberries! Oh wow, I think I would really freak out if a bunch landed on me...yikes! Thanks for the crisp love, Rachelle! Squirrels really creep me out! Years ago I was putting a bag full of garbage in our outdoor can and right when I lifted the lid off the top, a squirrel jumped out and bounced right off me. Never want to get that close to one again! I've never tried raspberries and rhubarb together. Sounds marvelous! Oh yikes, I think that would scar me for life! :) Thanks for the crisp love, Christin! haha I don't really dislike squirrels but your story was fun to read! Crisp is one of my favorite summertime dessert, this looks delicious Gayle! I am not a fan of squirrels either but my kiddos get so excited every time they see one...so strange haha! Fruit crisp is my favorite baked summery dessert and totally worth turning the oven on for:) Love this yummy raspberry and rhubarb combo! Haha I guess a lot of kids do like squirrels! :) Thanks for the kind words, friend! The squirrel thing cracked me up, Gayle! I kind of feel like they're staring me down too, they're a little creepy? On the other hand, this crisp look so delicious. I don't bake with rhubarb nearly enough, but I need to try it out more! They are creepy! Like bats with no wings and bushy tails! :) Thanks for the crisp love, Danielle! Those crisps look really delicious! Thanks for the kind words and for stopping by, Jeff! Oh I LOVE rhubarb too! I wish mine would grow already so I had some to bake with! You are like the squirrel whisperer, Gayle! Lol. It was really fun reading your story! Crisp is one of my favorite summertime dessert, this looks delicious Gayle! Thanks for the kind words, Puja! I can't believe a squirrel actually sat on your shoulder, that's crazy! I wouldn't want a squirrel that close either! This crisp looks amazing, I love the combination of raspberry and rhubarb, I've never had that before but I bet it's just fantastic! Isn't it crazy? I will never forget that! Thanks for the crisp love, friend!